When two or more parties, whether individuals or entities, enter into an agreement to combine resources for a specific business undertaking, it is referred to as a “joint venture.” The organization of a joint venture serves as a short term partnership for the duration of the project, in which each participant shares responsibility for the project’s associated costs, profits, and losses. Although the parties share responsibility, the joint venture is its own legal entity that remains separate from the parties’ other business interests. To explore this concept, consider the following joint venture definition. 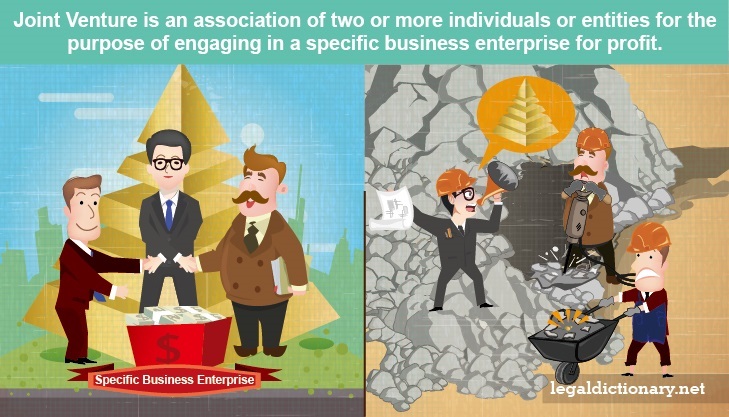 An association of two or more individuals or entities for the purpose of engaging in a specific business enterprise for profit. A joint venture (“JV”) begins when the parties enter into a contract or “joint venture agreement,” the specifics of which are of crucial importance for avoiding problems later on. In creating the agreement, the parties should state specifically the purpose and goal of the venture, as well as the venture’s limitations. The agreement should be very specific in outlining each party’s duties and rights under the agreement, taking into account that all parties are entitled to share in the profits as well as the losses incurred in the venture. Each party to a JV has a responsibility to act in “good faith” in all matters regarding the venture, taking care to uphold the interests of all parties involved. This amounts to a legal fiduciary duty to the venture, even if it becomes necessary for a party to place individual interests below those of the group. The joint venture agreement should specify both the formation and termination dates, or that the venture terminates when its purpose has been accomplished. Some JV agreements specify that the venture will automatically terminate if one of the members dies. Since two of the nation’s burgeoning railroads entered into a joint venture to expand rail service to a rapidly growing West Coast population in themed 1800s, the concept has experienced phenomenal growth. The idea of being able to join forces with another individual or company solely for the purpose of taking on a single business enterprise offers solutions to companies large and small. Below are two famous examples of joint ventures. Anticipating China’s rise to the top of the food and beverage global market, Kellogg Company entered into a joint venture agreement with Wilmar International Limited for the purpose of selling and distributing cereal and snack foods to consumers in China. While Kellogg brings to the table an extensive collection of globally renowned products as well as their expertise in the industry, Wilmar offers marketing and sales infrastructure in China, including an extensive distribution network and supply chain. Joining together allows both companies to profit from a synergistic relationship. The 2008 joint venture launched by NBC Universal Television Group (Comcast), Fox Broadcasting Company (21st Century Fox), and Disney-ABC Television Group (The Walt Disney Company) to create the enormously popular video streaming website “Hulu” is one example of a large scale partnering of companies that has been very profitable. Though individually the companies are competitors over the U.S. airwaves, combining their efforts to provide streaming content to billions of homes, computers, and mobile devices proved a powerful way to increase revenues. The success of Hulu has potential buyers lining up with offers topping $1 billion. Jointly Controlled Operations – while the JV with jointly controlled operations utilizes the resources and assets of each of the parties, each party incurs its own expenses, raises its own financing, and contributes its own assets to the venture. Jointly Controlled Assets – the parties jointly own and control the assets contributed to the JV, as well as the assets acquired by the venture, each receiving a share of the income and expenses of the venture. Jointly Controlled Entities – this type of JV requires the formation of a separate legal entity in which each party owns an interest. The newly created entity then controls the assets, liabilities, revenues, and expenses, of the venture. This jointly controlled entity maintains its own records for accounting purposes, preparing financial statements on a regular basis. If a party to the venture contributes money or other assets to the jointly controlled entity, the contribution is regarded as an investment. An individual experienced in creating, participating in, and dissolving joint ventures may become a joint venture broker (JV broker), using his expertise to pair up the right projects with the right people. The JV broker has been specially trained to assist businesses in the creation and management of Joint Ventures, increasing the chance the venture will be profitable. In addition to offering suitable partners for a JV, a broker often offers supportive services in marketing and other strategies for success. A JV broker generally has a large database of companies in a variety of industries, each looking for joint venture opportunities. By gathering all of the relevant information and doing the necessary research, a JV broker saves the individual or company time and money. Intellectual Property – Anything created by the human intellect, such as artistic and literary works, designs, images, symbols, and names.